We have been seeing a lot more Google users getting phishing email message to steal your Google user name and password. If you receive the email message appearing as if it came from a friend, family member or business, asking you to view a document that was uploaded to Google Docs/Dropbox or any other shared services, please delete this message. If you click on the link and login with your google account you will find that your account details will be sent to hackers to login using your account. 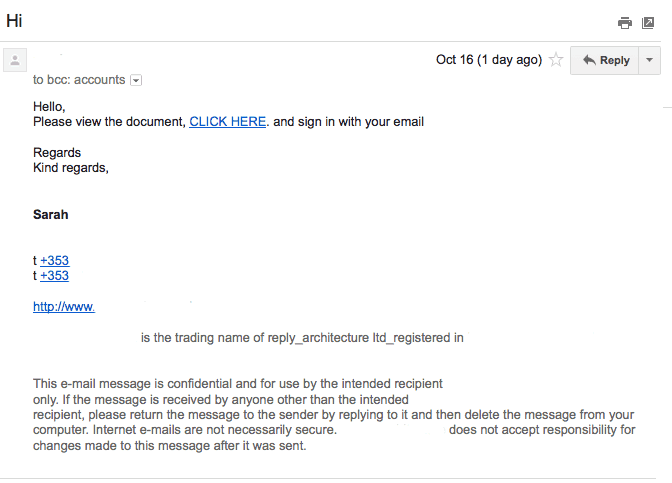 Another ploy they have had is to setup and filter in Gmail to delete all messages in future. You should reset your password and associate your phone number with your account in case of any reset passwords. Google Drive Keep Everything, Share Anything. Please check the document uploaded for you using Google docs. Adjust sign in with your email to view the document its very important.